The release of Microsoft Windows Vista has brought a deluge of products that use this operating system. Lots of announcements sound like "Now with Vista!" Indeed, despite the new hardware requirements, the only significant requirement for computers manufactured this year is a certain memory volume. Considering that one gigabyte has been a High-End standard for a long time already, most of them work fine under Windows Vista. The second problem, which had to be solved by manufacturers, was drivers for the new OS. On one hand, this problem is less significant for notebooks than for desktop PCs (because they offer much fewer configurations). On the other hand, there may be problems with replacing some component if it's not compatible with the OS. All the more commendable of manufacturers to have thought about it beforehand. Even now you can buy models with modern components and the latest version of the operating system from Microsoft. One of the first notebooks on the Russian market with preinstalled Windows Vista is the business notebook Acer TravelMate 5623WSMi, a desktop replacement. TravelMate 5620 series currently includes one model – 5623WSMi. Formally, it has three modifications. But in practice they are almost no different – one of them has two 512MB modules instead of only one (1 GB). The third modification comes with Microsoft Windows Vista. We have actually reviewed the third modification. Let's evaluate the hardware configuration of this notebook. It's based on the "updated" Intel Centrino Duo platform. It differs from the original version only in a processor – Intel Core 2 Duo instead of Intel Core Duo. The main difference between these processors is support for EM64T and SSE3, 2x2 MB cache (in some models) in Core 2. The T5500 processor installed in our notebook is the slowest model in the series (except for models with reduced power consumption). Probably that's why it lacks support for Intel Virtualization Technology. Out of doubt, it's not relevant now. But considering the business nature of this notebook, you should pay attention to it. The notebook uses the standard chipset for this platform – Intel 945PM with the ICH7M Southbridge. It's quite sufficient to support all necessary interfaces. Two memory slots allow to add another module to upgrade to 2 GB. But a single memory module (not very fast at that) used in the original configuration limits system performance. Discrete video (NVIDIA GeForce Go 7300) looks unexpected in the business model manufactured in 2007. Although this chip provides some performance advantage over integrated Intel GMA950, it's still impossible to use the notebook for modern 3D games (you can read about video performance below). Besides, 256 MB mentioned in the specifications consist of only half of dedicated video memory, the other half is allocated in system memory, when necessary. We should take into account that we used to run all tests under Windows XP. But Windows Vista has higher requirements to video performance, so a discrete video chip can be preferable here. Positioning this model as a desktop replacement for small and average offices is justified – it's much more convenient to work in the office at a large display, so the 17'' panel looks good here. What concerns its resolution, 1440×900 is an optimal choice for a panel of this size. Travelstar 5K160 hard drive from Hitachi is currently one of the fastest models (among RPM 5400 models). Power consumption of this drive is also low. This series offers models from 40 GB to 160 GB. The TM5620 uses a 120 GB model. This capacity is more than enough for most tasks. The drive initially has a hidden partition about 8 GB with a system restore utility. The remaining space is divided into two identical partitions. 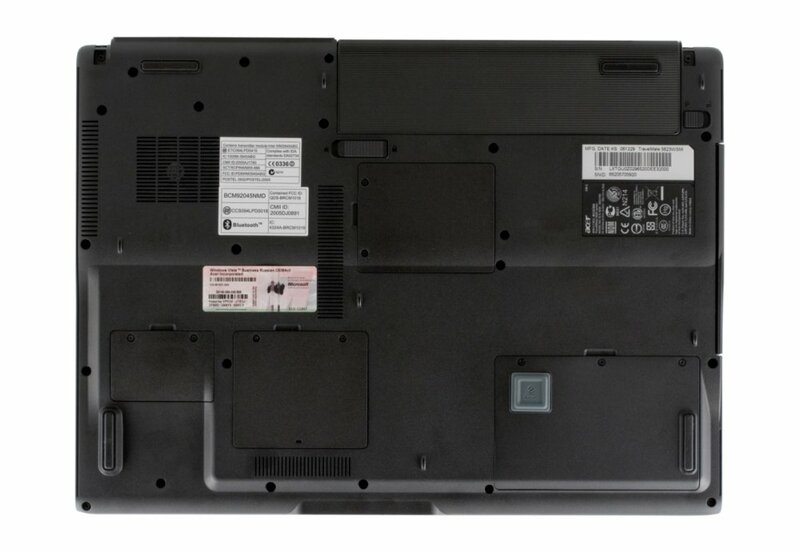 The notebook uses Acer DASP (Disk Anti-Shock Protection). Manufacturer of the optical drive (Optiarc) is a joint undertaking of Sony and NEC, so there must be no problems with this drive. AD-7530A is a relatively new model. It allows to burn discs of all formats (including double-layer DVDs and DVD-RAM) at up to 8x. Its CD speed can reach 24x. Communications are represented by a network adapter based on the Realtek chip, the wireless 802.11a/b/g controller from Intel, a Bluetooth adapter v2.0, and an analog modem. Note that the first two controllers use the PCI Express bus. 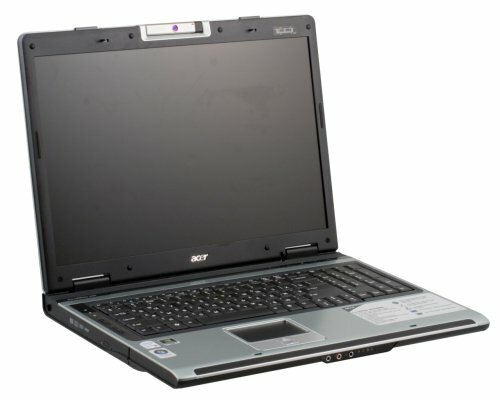 The notebook uses the Acer SignalUp technology to raise operating quality of the wireless connection. It's rather hard to evaluate its efficiency. But comparison with other Centrino-based notebooks shows that TM5620 enjoys a higher signal level. The audio system is based on HDA codec Realtek ALC883. Its capacities for outputting multi-channel analog signals are not used in this case. Along with a stereo line-out, you can use S/PDIF to plug external equipment. Additional equipment includes a web camera Acer OrbiCam (made by Logitech). According to the company, this camera has a 1.3 Mp sensor. It can be used with the bundled photo/video program or with any other software, for example, Skype. Unfortunately, video recording features are significantly limited by low efficiency of this camera. But as its primary application is Internet communications, this is not a problem. This model lacks an IEEE1394/FireWire port and an Express Card slot. In other respects, this notebook qualifies for its positioning. The 5620 looks very much like other models with 17" displays from Acer. The difference from other series (with 15" panels and smaller) consists in the design of the front panel with speakers – this time they look upward and covered with a black grid. Photographs fail to convey dimensions of the notebook – on one hand, the classic design of wide-screen models, on the other hand – a large 17" panel and almost a full keyboard. So if you are considering this model as your possible choice – you must examine it in a store or at least try to imagine it (400×295×44 mm) on your desk. The front panel houses a display lid latch, a group of audio jacks and indicators (power, battery, wireless LAN, and Bluetooth). The slightly bevelled edge houses stereo speakers. Note that the maximum volume level is not very high, but it's sufficient for an office. You are still recommended to use headphones or external speakers for multimedia applications. The left flank contains only a CD tray and a Kensington hole. Half of connectors for external devices is concentrated on the right flank. You will find a PC Card slot, a card reader, three USB ports, a vent grid, and a power connector there. The USB ports are spaced out well, so there will be no problems with simultaneous connection of several devices. But the PC Card slot and the card reader are installed so that it will be hard to use them at once. The rear panel houses another USB port, modem and LAN connectors, VGA and S-Video ports. Two small vent grids are placed on the bottom of the notebook. You can also find compartments for a hard drive and memory there. The layout of connectors corresponds to the positioning of this notebook as an office model. But it wouldn't have hurt to have a couple of USB ports on the left flank as well. 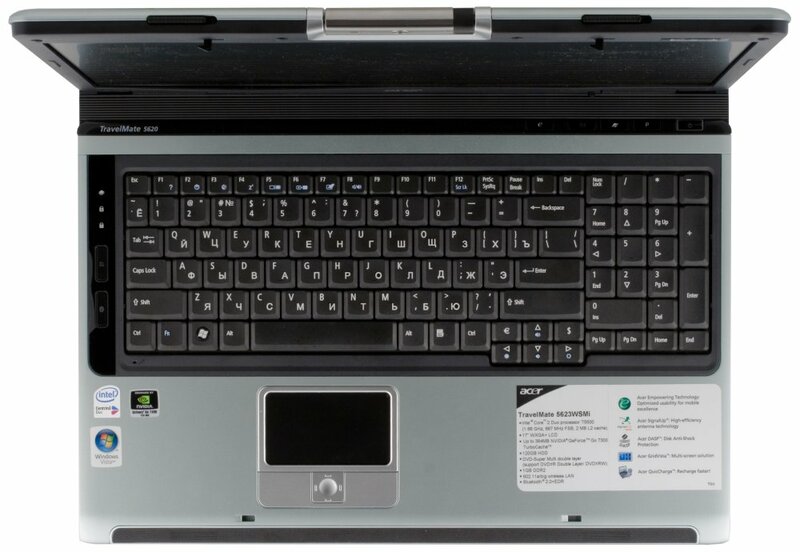 As the notebook uses a wide 17" panel, the manufacturer installs a keyboard with an additional block of digit keys. 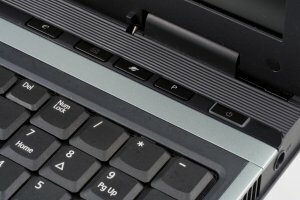 It may be convenient to those users who like to use additional buttons on desktop computers. Its dimensions and layout match those of usual keyboards. But you will have to get used to PgUp, PgDn, Home and End – they are noticeably smaller and rearranged. Besides, if you have already worked on a notebook with the standard keyboard, you will have to watch how you use cursor keys – they are not at the right border :). The main group of keys is standard. Note a couple of wide Shifts, a wide Backspace, and a narrow "~" button. 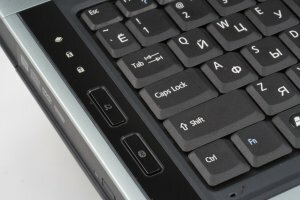 The size of main keys is 18×18 mm, the upper row – 15×12, cursor keys - 18×12. Additional buttons (four) are in the upper right part of the panel, near the power button. You can remap all buttons. There is another group of components to the left of the main unit – three indicators (HDD, CapsLock, NumLock) and two buttons to control wireless interfaces (Wi-Fi and Bluetooth) with built-in indicators. There is a touchpad from Synaptics with two standard buttons and a joystick for scrolling in four directions under the keyboard. The notebook with its battery and an optical drive weighs 3.48 kg. The power adapter with a cable weighs 560 g. It's a very good result for a 17" model. Problems with transportation will most likely be caused by notebook dimensions – usual bags and rucksacks are too small for this model. What concerns the cooling system, unfortunately, the fan works in all modes, although at a low speed. Perhaps it's not very important for office work. But don't forget that quiet operation is one of the reasons to use a notebook instead of a desktop. This minimal noise cannot be eliminated with any standard tools under Windows XP or Windows Vista. A new power profile and the reduction of CPU clock to 1 GHz did not help. Perhaps, the situation will be fixed in new BIOS versions or with the help of proprietary software. The exhaust air from the vent holes on the right flank is barely warm. The fan accelerated during some complex tasks (for example, video encoding) and grew proportionally noisier. What concerns the case of the notebook, it got warm to the right of the touchpad. We tested a sample ready for sales, so this time we have precise information about the bundle. Quite a compact box contains: a notebook, a battery, a power supply unit with a cord, a modem cable, a user manual, and a couple of fliers (for beginners, warranty information, and office addresses). As you can see, there is nothing luxurious. But it would have been good to see a mouse in this bundle. Especially considering positioning of this notebook. You can also buy a 3.5" floppy drive, a power supply unit, and a battery (but the official web site does not provide precise information about it). We tested the panel by our standard procedure. The notebook was plugged to the supply line, its brightness was set to maximum. The panel demonstrated average response times - 25 ms. This parameter in last year's reviews varied from 12 ms to 42 ms. Most models offered 20-30 ms. By the way, minimal results were demonstrated by notebooks with discrete video. So, manufacturers seem to use fast panels in gaming models. The same concerns brightness, contrast, and uniformity of backlight – the TM5620 panel demonstrates average results. Subjectively, we have no gripes with brightness and contrast. But as vertical angles of view are narrow, you should carefully adjust inclination of the display lid - even the smallest deviations from the optimal angle result in significantly worse contrast. In particular, you have to adjust the angle of the display lid, even when you move a little at your desk. Besides, you'd better use contrast desktop themes and avoid using smoothed fonts. Before running our tests we backed up Windows Vista and installed Windows XP Pro, because benchmarks and special utilities are not quite friendly to the new operating system. When the problem is solved, we shall certainly test notebooks under Windows Vista as well. We'll describe how TravelMate 5620 works under this OS below. Traditionally, we tested battery life with BAPCO MobileMark2005. We also published the performance score in parentheses for the Productivity test. We used the standard Portable/Laptop scheme adjusted for constant operation of the display and hard drive. The display was set to maximum brightness. Performance demonstrated by Acer TravelMate 5623WSMi in our tests is similar to that of other notebooks with processors Intel Core Duo / Core 2 Duo, 1.66 GHz. Interestingly, the use of the second generation of Core did not produce any effect. However, it's confirmed by the other tests as well. What concerns battery life, the results obtained are typical of models positioned as desktop replacements, where this parameter is not relevant. Maximum battery life in the Reader pattern is about two hours, which is approximately twice as short as in models designed for mobility. But it's a very good result for this class of notebooks. The large panel, discrete video, and an average-capacity battery play a significant role here. Although NVIDIA GeForce Go 7300, installed in this notebook, is a true 3D accelerator, you cannot play modern 3D games with it. 3DMark2003 proved this – 640×480 – 4634, 800×600 – 3522, 1024×768 – 2580, 1440×900 – 1265. Of course, these results are twice as high as GMA950 results. But the gap to GeForce Go 7600 (which is often used in multimedia and gaming notebooks) is three of four times. The latter demonstrates results similar to NVIDIA GeForce 6800 XT used in desktop computers. Additional tests with NVIDIA Powermizer revealed the lack of effect of this technology on business applications – performance and battery life remain almost the same. But 3D performance drops manifold. Note that the situation may change under Windows Vista. We'll try to check it up, when there appear tests that can run under this new OS. The notebook is fully compatible with the new version of the operating system from Microsoft. All devices used in TravelMate 5620 have certified drivers. Most of them are developed by Microsoft, of course. But what concerns the video, audio, modem, web camera, card reader, touchpad, wireless adapter, Bluetooth controller – all of them have original drivers from their manufacturers. Bundled third-party software includes Norton Internet Security (antivirus and firewall, 90-day trial), NTI CD & DVD-Maker 7.7 (optical drive utility), NTI Backup NOW! 4.7 (backup utility), Cyberlink PowerDVD 6.0 (a player for DVD-Video and multimedia files), Adobe Reader 7.0. The next numerous group of programs has to do with the Acer Empowering technology. All utilities are united into a framework. By default, all programs are grouped in a single launcher. Besides, most modules can be displayed as widgets. Let's see what programs are included into the Empowering bundle and how useful and convenient they are. The first program is eNet Management – it's used to configure network connections of the notebook. In fact, it's a superstructure over the standard OS tools, presented in a more comprehensive and simple way. This program has a useful feature - it can create profiles with network settings and can quickly switch between them (manually or automatically). Along with network connections proper (wireless and cable), a profile may include shared folders, printers, and some other parameters. There is an option to manage PPPoE and VPN connections. You can also export and import settings. The program also contains buttons to call system dialogs to configure hardware parameters, which can be used to fine-tune network settings. On the whole, eNet Management can facilitate configuration of network connections for beginners. The second program – ePower Management – is a utility that allows to manage power consumption of a system. Like eNet, this program uses practically only system features (except for setting display brightness). Note that Windows Vista offers much more power management settings, but many of them are hidden in "Advanced" parameters. So ePower may be more convenient to some users. ePresentation Management is used to select display mode and resolution for an external projector, when you conduct presentations. The next couple of programs belongs to the Security category. eDataSecurity Management allows to create a Personal Secure Disk protected by a password. You can also encrypt selected files. Program shortcuts are created in the context menu and in the explorer menu. The only problem is that it's hard to remove a secret disk. We do not have precise information about encryption parameters, but the software developer mentions 128, 192, and 256 bit keys. eLock Management can be used to block access (password) to removable media – optical and floppy discs, USB drives. eRecovery Management is a backup utility, which works with the entire system partition of the hard drive. It supports full and incremental backup modes. The second function of this program is to create images of OS and programs/drivers to burn on discs. The last program – eSettings Management – provides complete information about all devices in the notebook. You can also change the bootup order of drives and set a startup password in BIOS. Empowering utilities produce a nice impression. You can use special utilities, of course, which can do the above mentioned functions better. But this suite can be useful for a beginner. Let's also mention Acer GridVista, which adds several interesting features to a standard desktop - these features make it more convenient to work with several applications at once. While there are no problems with drivers under Microsoft Vista, when you start some programs (for example, LiveUpdate and NTI Backup NOW!) the system asks to confirm this operation (it's one of Vista's functions to increase system security; but it would have been more convenient if these applications would have been included into the trusted list). We've also encountered some problems, when we tried to connect to a wireless network (or maybe it's just that we are not used to this operating system yet). On the whole, usual operations under Windows Vista are no different from those under Windows XP Pro both in speed and in battery life (remember, this parameter is not very important here, as this notebook is a desktop replacement). But we noticed that the fan in the cooling system was rotating more often under the new OS. And memory load right after startup was about 50%. So in a certain sense, the new operating system moved this notebook down to Middle-End. If you plan on using memory-intensive applications, you are recommended to increase your memory size to 2 GB. An attempt to compare startup/shutdown times and the memory size occupied by an operating system demonstrated that Windows Vista and Windows XP were practically identical. You should pay attention to memory only – the new operating system "gobbles up" several dozens of MB more in this notebook. Here are the results of the built-in Windows Vista benchmark: processor 4.7; memory 4.5; graphics 3.5; graphics for games 3.1; the main HDD 4.3. We cannot compare these results with other models so far. But we can see that this time it's the video card that acts as a bottleneck (however, it copes with all features of the new interface without any problems). Acer TravelMate 5623WSMi is an inexpensive model with a 17" panel based on the second-gen Intel Centrino Duo platform with an Intel Core 2 Duo processor. Its positioning as a desktop replacement for business users is quite justified: a large panel, a fast processor, and a necessary set of communication features. All these elements come in a good case for a relatively low price. We should also mention a web camera and a card reader. The lack of Express Card and FireWire is a drawback only for those users who know exactly what they need them for. What concerns the new operating system, Microsoft Windows Vista, used in this model, this configuration copes well with the increased performance requirements. We cannot recommend notebooks with the new operating system to all users. But if you like to stay on the edge, you should give it a try. And if you buy your first computer, you should certainly choose a model with Microsoft Vista. We express our thanks to the Russian office of Acer for the provided notebook.